Everyone loves a singalong! What about hearing where some of your favourite songs came from? 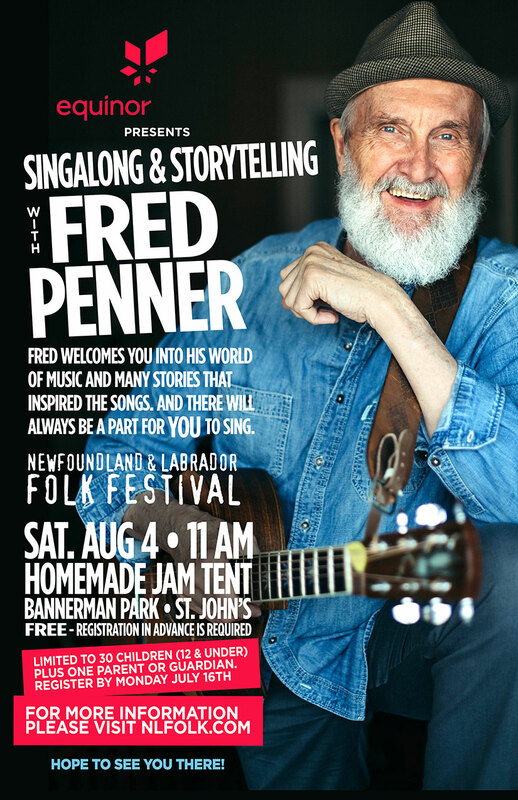 Join Fred Penner, the four-time Juno award-winning children’s performer, as he leads a group of kids through an interactive performance: Equinor Singalong & Storytelling at the Newfoundland & Labrador Folk Festival. Fred welcomes you to his world of music and the many stories that inspired the songs. And there will always be a part for YOU to sing. His performances are great family fun, with energetic singalongs to classic tunes. Join him at the Newfoundland & Labrador Folk Festival Presented by Equinor, on Saturday, August 4th at 11:00 AM in the Homemade Jam Tent as they invite thirty children for an opportunity to sing and learn about songs that we have all grown up with, including grand hits like The Cat Came Back, Sandwiches, You Can Do It, and many more. All participants will be entered to win a gift certificate from O’Brien’s Music Inc., courtesy of Equinor. under) and one parent or guardian. *Deadline for registration is: Monday, July 16.